The Two Ewes continue to shine a spotlight on Front Range Bags by Nancy Totten. Nancy has generously offered a project bag from her shop to a lucky Two Ewes listener. Kelly has one of her bags in SF Giants fabric and it's great! High quality, nice and roomy, and lots of handy features. It was the perfect bag for the Crackerjack Cowl project during baseball season. To enter, take a look in the Front Range Bags shop and report back to the contest thread in the Ravelry group. Tell us which bag you like best (exclusive of the custom orders) and let us know about your favorite features in the project bags you use. A winner will randomly selected during our podcast episode 30. Thank you Nancy! We appreciate the opportunity to spotlight your bags and your shop! This week Marsha and Kelly record separately due to busy schedules. 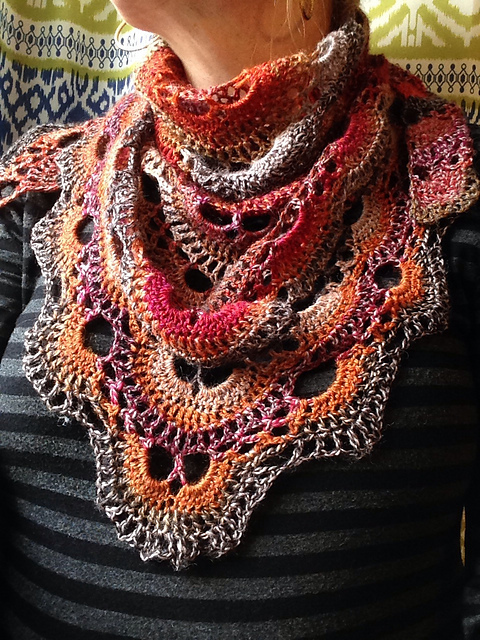 Marsha has finished her Crochet-Along project, the Virus Shawl. Marsha also finished her son's Tricolor Socks made from her handspun from last winter. 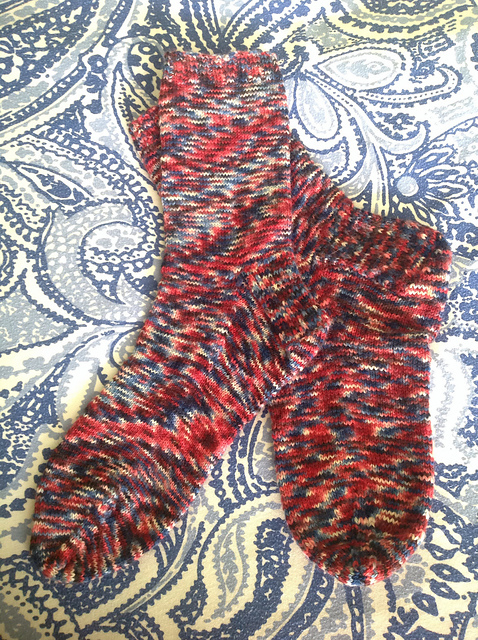 He turned 18 earlier this month so she finished the socks for his birthday. He bought himself a birthday present that is every mother's nightmare! A motorcycle, which he is using to transport his bicycle! Marsha is currently working on a scarf for her brother from the Stonehedge Fiber Mill Crazy that she bought in Portland. 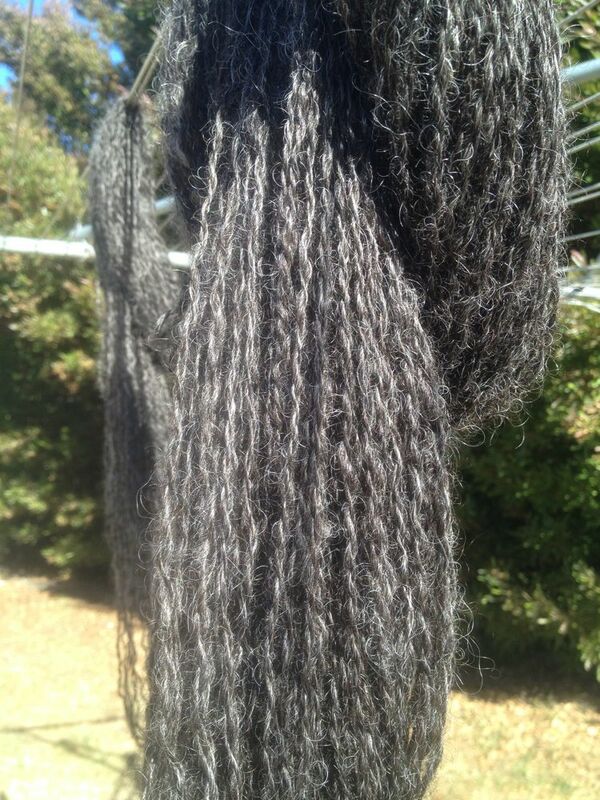 She is also using the yarn that she created at Yarnia in Portland. She is making the Stripe Study Shawl by Vera Valimaki. 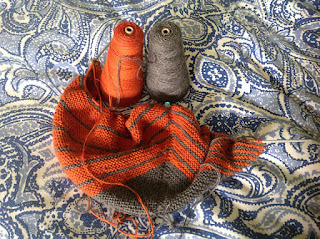 Kelly has no finished projects and very little knit or crochet progress. The one project that got some time was the crochet hippo that she is making for our Crochet-Along. 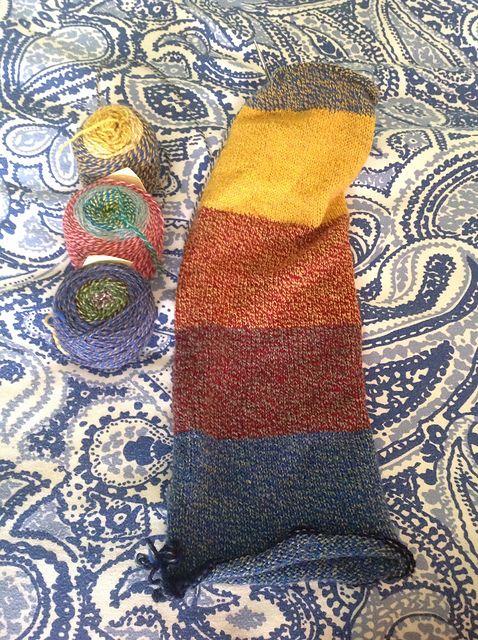 She has been doing lots of fiber work, though. 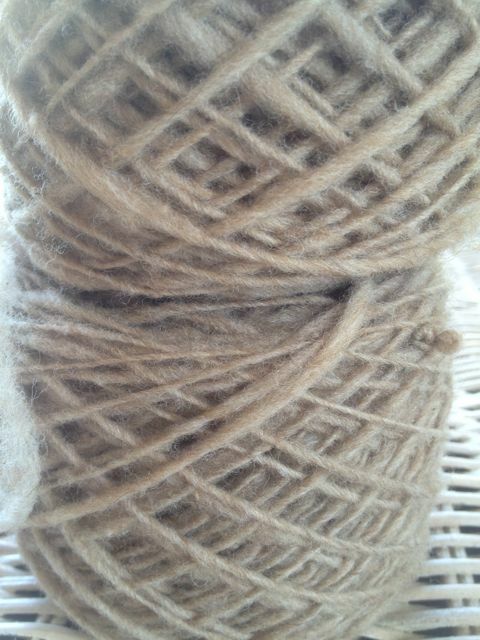 She is spinning Wensleydale for her Aunt's vest. 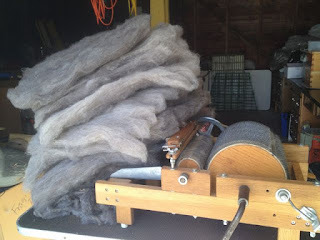 She is finally able to spin on the Salish Spinner and has been using it to spin a bulky yarn from the CVM fleece. She is also carding a very old, gray fleece of medium weight from a sheep named Charlotte. All of this fiber activity is a result of cleaning up and organizing her large fleece stash. At the end of the episode we talk books! Marsha reviews three books that she has added to her fiber reference library. The Fleece and Fiber Sourcebook and the Field Guide to Fleece, both by Carol Ekarius and Deborah Robson and Hand Dyeing Yarn and Fleece by Gail Callahan. 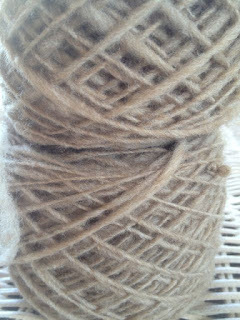 Marsha also talks about Adventures in Yarn Farming by Barbara Parry. Kelly reviews a book that was generously sent to her by Interweave/F+W. Simple Woven Garments: 20+ Projects to Weave & Wear (Interweave/F+W; May 2015). "This book is a pattern and idea book for creating uncomplicated woven shapes and turning them into highly wearable, everyday fashions." 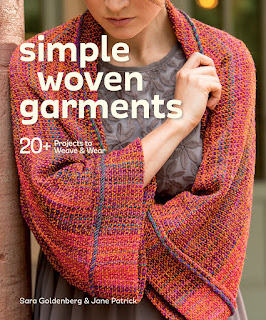 This book is currently on sale for $17.34 at the Interweave Store. The photo above shows the shrug that Kelly talks about in the episode. 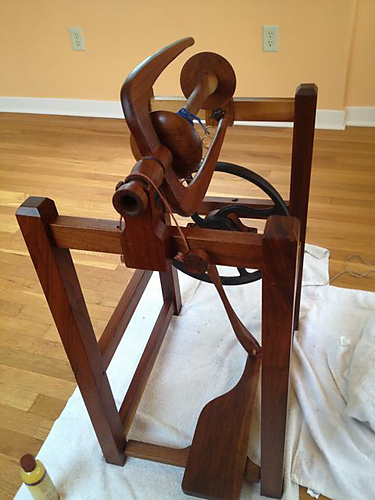 Sara Goldenberg received her MFA in fibers from CSU in Fort Collins, Colorado. As a textile artist, Sara has shown her work in solo and group shows throughout the United States. 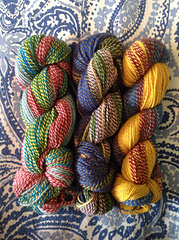 Sara teaches weaving at colleges, conferences, and at her local weaving shop. Jane Patrick is the former editor of Handwovenand vice president of sales for Schacht Spindle Company in Boulder, Colorado. 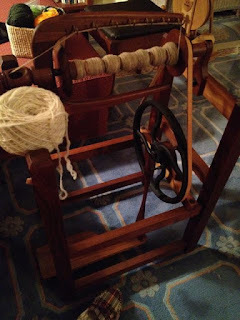 She is the author of Time to Weave and The Weaver’s Idea Book and the coauthor of Woven Scarves, as well as the author of the videos Weaving on a Rigid Heddle Loom and Inkle Weaving from A to Z.